That thing of beauty that is the Azkals' 4-0 win. FOUR-ZERO! That’s the unbelievable scoreline of the Philippines against our Southeast Asian neighbors Indonesia in the Suzuki Cup, and if you tell me that you expected such score before the game, you’d be dragged to the sanitarium for being delusional. And that came after that impressive 4-1 win over Laos, when we trailed by a goal, in the first game in Vietnam. Then, we all wondered, when was the last time we scored four goals in the Suzuki Cup? The answer, never! And now this! I know the last time we allowed four goals in back to back matches and that was in 2006, in the then Asean Football Championships. And it’s not that Indonesia played badly or had a bad day, it’s just the Azkals were just too good. We see them develop those plays from the backline so effortlessly that we sometimes forget, just a few years ago, stringing a few passes in international play would be a rare occurrence. Most of us remember those back-to-back losses to Indonesia in the 2010 semifinals, but even before that, the Indonesians humiliated us in 2002, routing the Philippines 13-1. Some of the stories coming out of that edition were ridiculous, some of our players were reportedly approached by other teams as they had running bets on how many goals they’d get against the Philippines. that these guys are playing their club football in the Philippines. Yep, the Azkals’ rise—and thanks to the turnaround of ABS-CBN—will get Philippine football greater mileage and of course, new fans. It will help, too, raise the profile of club football in the country and in Southeast Asia as well. We just obliterated Indonesia for crying out loud! And we made it to our third straight semifinals with a game to spare. Whatever happens against Vietnam, we are in the semifinals. Of course, we could settle for a draw but why do that? Let’s remind Vietnam again of the historic day when they faced the Azkals, when, for 90 minutes, we owned their stadium. 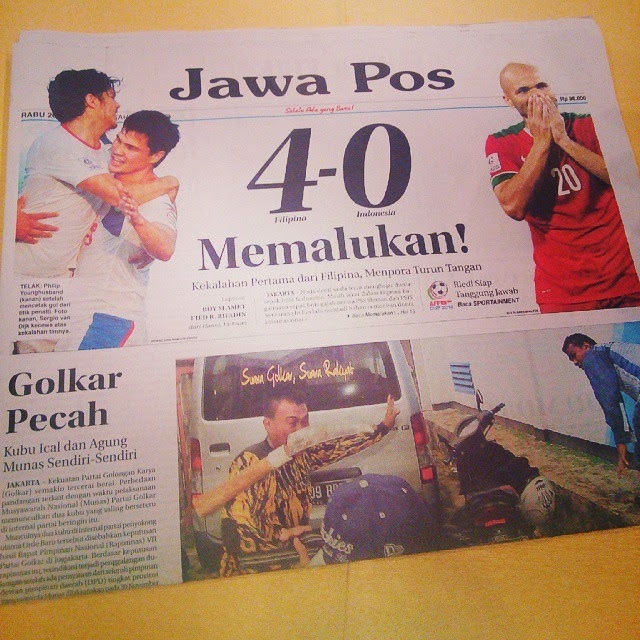 Four-zero against Indonesia? How sweet it is to be a football fan these days! I can’t wait for the semifinals. magaling na talaga ang Azkals ngayon, thanks sa coaching staff at kay Boss Palami,ay kalami sa feeling.